Typepad Knowledge Base: Domain Mapping: Yahoo! To set up the domain without the www, you need to create a Forward in your Yahoo! Domains account. With most domain registrars the non-www set is done last, but with a Yahoo! domain, the forward needs to be set before the CNAME. 1. Login to your Yahoo! Domains account and view the My Services page. 3. Go to the Domain Control Panel > Forward Your Domain. 3. Click the Create Forward button. And click Continue. If you do not include the backslash, /, at the end of the domain, you will receive an error, so the backslash is required to complete the forward. 5. Select Standard Forward for the Forwarding Option and click Submit. 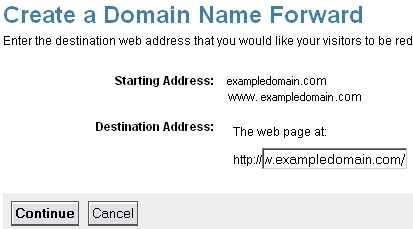 This creates a forward from non-www domain, exampledomain.com, to www.exampledomain.com. The related Yahoo! support documentation is available here. 2. Go to Domain Control Panel > Manage Advanced DNS Settings. Where example.typepad.com is replaced with your Typepad domain name. 4. Click the Submit button. You will be asked to confirm the creation of a CNAME Record. Click the Submit button a second time. 5. On the Advanced DNS Settings page, you will see the CNAME Record has been added to the list of records. After setting the CNAME Record at Yahoo, it can take 24-48 for the domain to resolve. Once the CNAME is set up correctly, go to Account > Domain Mapping inside your Typepad account. Check the Activate link next to the domain.